OVERLAND PARK — There’s something about shared joy and pain that brings people together. Such was the case for a group of moms at Holy Cross Parish in Overland Park, who formed the St. Monica’s women’s group. It was not only a shared love of their children and a desire for fellowship with other moms in their situation that led them to form the group. For some, it was a place to draw support as they dealt with miscarriages and infertility. Not every woman in the group struggled with these issues. But those who did credit that support — and a 54-day rosary novena — with their successful pregnancies. “It’s been really great and a blessing that the group is spiritually focused. We’re all young moms trying to raise our kids Catholic,” said Holy Cross parishioner Rebecca Heiman, who has three children. “We help watch one another’s kids at times, pray for one another and just energize each other when someone has a need,” she said. There are currently 12 to 15 moms in the core group. More come and go as time allows. 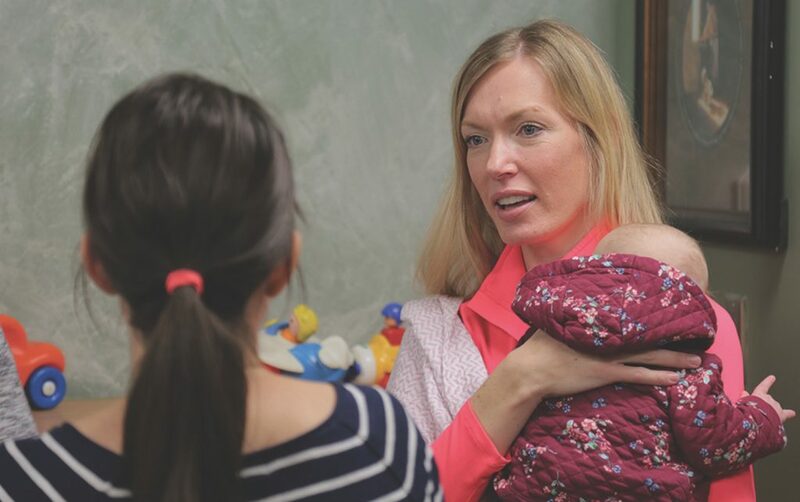 The moms meet formally once a month in the evening at church and informally with their children for playtime every Wednesday after the 9 a.m. Mass. Some of the moms formed a home school co-op that meets on Wednesday morning as well. The group pitches in with meals when someone has a new baby and is always ready to share advice about everything from toddler tantrums to potty training to sibling rivalry, Heiman said. When Kristen Cillessen and her family moved to Overland Park in 2013 and joined Holy Cross, she prayed for the opportunity to meet more Christian friends, and specifically more Catholic moms. As a stay-at-home mom, she was lonely and her family was “struggling to feel at home in our new parish,” she said. When she read a notice in the bulletin announcing the formation of a moms’ group, she was thrilled. “These women are now like sisters to me,” Cillessen said. “We share the common bond of raising young children but, in addition, we share our faith stories and so much more. Emily Schmitz and her family are members of Holy Spirit Parish in Overland Park. However, she was drawn to the Holy Cross moms’ group. She was one of the women who prayed the 54-day rosary novena for the special intention of getting pregnant. Fellow Holy Cross parishioner Stephanie Gramer said the group is different than most groups designed for young moms. It’s the underlying faith that makes the difference. “Because of our faith, we have confidence that we are all coming from the same place of love and trust each other with opinions and advice,” Gramer said. “The women are so humble and not afraid to be themselves. “It seems so basic — starting a meeting with a rosary or meeting after Mass to play. But basing our friendship on our faith has really strengthened us as friends.